Major airlines are canceling flights and notifying passengers of delays ahead of the blizzard expected to hit the D.C. area starting Friday. The potentially historic storm could dump nearly 2 feet of snow on the region. 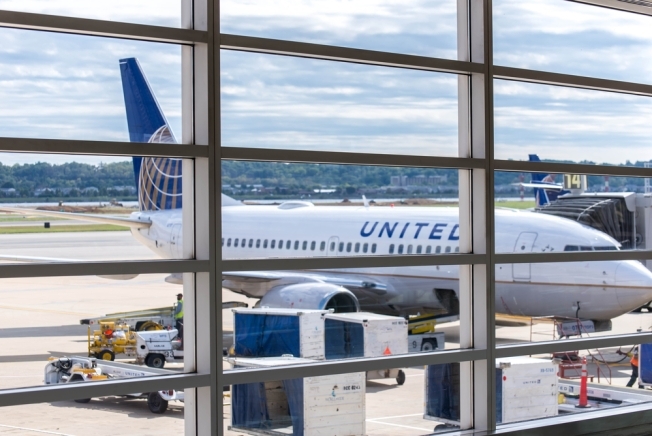 United tweeted the airline suspended all flights departing from Washington Dulles International Airport and other mid-Atlantic airports starting 4 p.m. Friday. Flights out of Dulles are expected to resume Sunday, depending on conditions at the airport. Check your flight status online. Travelers departing from a long list of affected cities Friday through Sunday can accept a travel voucher for changing their flights, the company wrote on Facebook. Southwest Airlines issued a travel advisory, warning customers about possible flight disruptions from Thursday through Sunday. Customers can reschedule their tickets or travel standby (within 14 days of their original travel date) for domestic Southwest flights leaving from Baltimore/Washington International Thurgood Marshall Airport (BWI), Washington Dulles (IAD) and Reagan National (DCA) between Friday and Sunday. For any canceled flights, customers may request a refund. "We have not canceled any flights at this time and we do not have any predictions on the number of flights that may be affected," said Southwest spokesman Brian Parrish via email according to according to USA Today. "We will continue to monitor the storm and make operational adjustments, if necessary, over the next few days." Delta released a similar statement, stating that they will refund flights that are canceled or significantly delayed between Friday and Sunday. For travelers wishing to change their flights even if they haven't been canceled, Delta will also allow one-time changes to tickets for no fee if the rescheduled travel begins no later than Jan. 27. Several other airlines have all released similar options, offering travelers a refund or a rescheduling due to the storm. "We want to give our customers plenty of time to make decisions about their travel plans," said United Airlines spokeswoman Maddie King, USA Today reported. American Airlines provides relaxed change fee policies and contact information for trip changes on their website. They have started canceling flights into and out of various airports on the east coast, including D.C. airports. American Airlines tweeted, "We've canceled flights across the Northeast US". JetBlue's website says travelers may rebook their flights for travel through Jan. 29 for no extra charge and that customers may request a refund for canceled flights. Frontier will waive flight change fees, according to their website, but the origin and destination must be the same and the travel must be completed by the end of January. Customers may opt for a refund if their flight is canceled.